Do you or does someone you know have narcolepsy? Access to credible information can help improve understanding of narcolepsy symptoms and their impact. These resources can help you find a support group or learn more about living with a rare disorder. 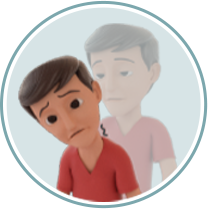 Know Narcolepsy provides tools to help better understand your symptoms and their impact. Download our educational resources and connect with us on social media. Connect with us through these social media outlets. Be sure to visit our YouTube channel for personal stories about living with narcolepsy. *The Know Narcolepsy Survey was a three-party survey of 1,654 US adults including those with narcolepsy (n=200), the general public (n=1,203), and physicians (n=251) currently in clinical practice who have treated patients with narcolepsy in the last two years. The survey was conducted online in March, April, and August 2018, respectively, by Versta Research on behalf of Harmony Biosciences, LLC. The Narcolepsy Network collaborated on the patient survey. A national patient support organization focused on educating and empowering people with narcolepsy as well as the public at large. The Narcolepsy Network has gathered a list of reliable groups where people living with narcolepsy can share their experiences. Find a group in your area. A 501(c)(3) not-for-profit organization that seeks to raise narcolepsy awareness, bringing direction to the search for a cure while providing a strong community of support to patients and caregivers. Wake Up Narcolepsy keeps an up-to-date list of their Living With Narcolepsy meetings and relevant events throughout the country. It helps being able to share and talk to someone about everyday struggles with narcolepsy. A membership organization dedicated to partnering patients, providers, and the public to improve the lives of patients with sleep disorders and highlight the importance of healthy sleep. A non-profit organization dedicated to improving health and well-being through sleep education and advocacy. An organization raising awareness about sleep health and sleep conditions. Global Genes is a global patient advocacy organization that focuses on connecting, empowering and inspiring the rare disease community. A patient advocacy organization committed to the identification, treatment, and cure of rare disorders through programs of education, advocacy, research, and patient services. *The third-party sites listed above are for informational purposes only. Know Narcolepsy strives to provide the most useful and accurate resources available to people living with narcolepsy, but we do not endorse and are not responsible for the content found on these websites.